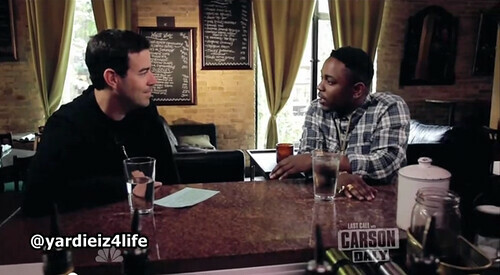 K. Dot sat down recently with Carson Daly on "Last Call" to discuss a variety of topics. During their chat Kendrick talks about having heat on his first album, the use and power of visualizing in order to make great music in the studio, getting his fans to "know" him in sixteen bars, escaping the influences of the city, seeing his first Dr. Dre, Snoop Dog and Tupac video being filmed, and the impact of mentoring conversations with Game and Dr. Dre. This is a good interview. Check it out down below. A$AP Rocky Brings Out Bun B, Slim Thug, Kendrick Lamar & OG Ron C In Houston (Video). This entry was posted in Interview and tagged Carson Daly, Kendrick Lamar. Bookmark the permalink.